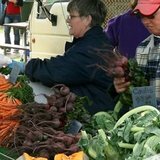 Most of us are now familiar with Farmers' Markets. If not, I suggest you get to know a bit about them here because they greatly benefit shoppers, authentic food growers and producers, the community and the environment. They're also a bunch of fun, giving you the opportunity to develop relationships with growers and producers and foster relationships in your local community. Some will already know, and some might have just discovered, that one of their key aims is giving farmers the opportunity to sell high-quality, freshly-picked produce direct to the public, thereby gaining the full benefits of their efforts. By supporting local farmers, customers directly put money back into regional communities. Trouble is (or has been) that re-sellers, or organisations buying produce and then re-selling it, meant that the public was not buying the freshest possible produce directly from the person who grew or made it. I experienced such a scenario at a Farmers' Market recently, where a huge fruit and vegetable stall resembled a large greengrocer shop verging on the produce section of a supermarket. Every imaginable item was available, including mangoes and bananas (which are not grown in Victoria, but in more tropical, northern areas). At a glance, I knew the stall was operated by a re-seller; there is no way they could possibly have grown the variety of produce on offer. I suspect too that some of it had come from overseas. By buying there, I'd not only be supporting overseas growers instead of local, Victorian ones, I'd also be contributing to food miles and damage to the environment. As a result of the above, a Farmers' Market Accreditation Program has been developed. 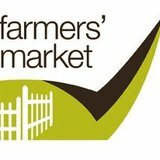 (This site also lists Accredited Victorian Farmers' Markets.) Accredited stallholders have passed stringent requirements to give the public confidence in the authenticity of the produce. We can then rest assured that stallholders displaying an official Farmers' Market Accreditation symbol grew or raised the produce, or are specialty makers who produced the goods. Many entire markets are also accredited. In order for markets in metro areas to gain accreditation, at least 90% of their stallholders must be accredited; for regional farmers' markets, 75% of the stallholders must be accredited. The bottom line is that shopping at accredited stalls and Farmers' Markets offers much greater benefit to both the consumer and our regional farming communities. If you'd like to find Farmers' Markets in any Australian state, see the Australian Farmers' Markets Association website – and remember to look for the tick of Accreditation. Why? For a fresh food & friendly win-win situation for all.